Denver Super Towing- The Colorado Towing Experts! Denver Colorado’s Best Towing Service: Tow Trucks, Winch Outs, Jump Starts, Fuel Delivery and Parking Management. Regardless of how, why or when you need a towing service, Denver Super Towing is prepared to get you and your vehicle transported. Simple as that. We're the best that the Denver towing industry has to offer. Notice we didn’t toss in anything like, “without damage” or “without trashing your vehicle”. Well that’s because it should go without saying. We shouldn’t have to advertise that our towing service won't damage your vehicle. It's a given. After all, we're professionals. Do you want to work with a Denver towing service that expects extra credit for not damaging your vehicle? No? Then go ahead and give us a call at 720-800-6161. We're guessing you're here because you have a vehicle in the Denver area that needs a little help. Maybe a tow or maybe you just need a jump. Either way, you have a vehicle and something ain't quite right with it. Are we on the right track? It's a safe guess since most people don’t just throw "towing service Denver" into Google for fun. This is typically a purchase you don’t plan to make which is why it can so frustrating when you get a real lemon of a towing service. Well you don’t have to worry about that with Denver Super Towing. Go ahead and check “find the best towing company in Denver and get myself out of this ditch” off your list. The fact is, the only time our competition keeps up with us is when they are hooked up to the back of one of our tow trucks. ​Yeah, Denver Super Towing is that good. ​Still not sure? Click here to call or dial 720-800-6161 and let us show you why we're the best Denver towing service. Period. We're able to separate ourselves from the rest of the Denver towing services out there for one reason: our commitment to service. Not service for the vehicles, not services for our drivers but service for our customers- the good folks of Denver, Co. But before you start to think that we're just good humans (which we also happen to be) let us remind you that at Denver Super Towing we realize you have the power. While you may be stuck on the side of the road, if you don’t call we don’t eat. You don’t like what we do? We don’t eat. We make you wait in a ditch 3 days? Now neither of us have eaten. We're better because we're hungry, hungry to succeed, and that means giving you the best towing service in Denver. When you give us a call and speak with our friendly dispatch team we will give you our best estimate of our arrival time based the location of the nearest tow truck to you. We will discuss what service you're looking for and how we can best serve you. Whether you need towing service, fuel delivery, a quick jump start, help with a lock out or even a winch out after getting stuck in some of that sudden Denver snow, our nearest tow truck will be there ASAP. Towing service from four on the floor or rolled up on our flatbed to motorcyles and RVs. If it has wheels (or even had wheels) we can tow it for you. Regardless of the make or model our drivers know where to hook up- and where not to. Flat Tire service for when that "bump in the road" turns out to really be a nail hitting your tire. Roadside maintenance of any kind is dangerous. Let a towing professional work the road and fix your flat. Fuel Delivery for when that fuel gages fails you. You had one job, fuel gage! But don’t worry. It’s an easy fix. Your baby only takes premium? Just let us know. We got diesel too. Jump Start service when you left your jumper cables in your “other car”. It's ok if you didn’t prepare because we did. And if you find your car parked in an “impossible” to reach spot we have a jump box to get you hooked up anyways. Illegally Parked Vehicles Your property, your rules. Let us be the enforcer. 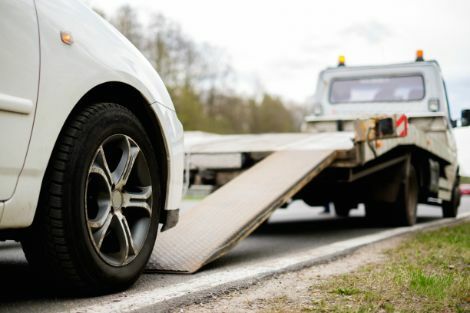 Whether you are a homeowner waking up to find a car blocking your driveway Saturday morning or you are a business owner with a parking lot full of freeloaders, Denver Towing is ready to make your problem disappear. Literally. Give us a call at 720-800-6161 and let us take care of your problem. Your problem isn't on the list above? Give us a call anyways. We're the local towing service that does it all. If you have a problem with your ride while you are away from home we have a solution. What is the location of your vehicle and will someone be present with the vehicle? What type of service is requested and if applicable, where do you want to take your vehicle? What type of vehicle- year, make, model and color? 2. You will receive service from one of our experienced, knowledgeable and courteous Denver towing professionals. Our goal is to get you hooked up as quickly as possible so we can get to everyone’s favorite and last step. At the end of the day (which really doesn’t exist for us, we're ready to go 24/7), we know that we aren’t just in the towing business; we're in the people business. While it may feel like you need us a lot more than we need you we know that isn’t the case. We know that we need to give you best service available in the great city of Denver. That way we all win. We don’t advertise your basic expectations. At Denver Super Towing, we exceed them. Maybe you have questions. Well here are some of the most common questions we get. We decided to include the answers here as well. Service baby! We provide full service (towing and the works) in Denver, Lakewood, Englewood, Aurora, Arvada, Littleton, Commerce City, Brighton and Parker. We service cities in and around these areas as well so if you find yourself in a little nook of the Denver Metro area that isn’t listed (looking at you Glendale) give us a call and we can get your situation solved. What don’t we do? We provide towing of motorcycles, cars, trucks, SUVs, RVs, tow trucks (yep) and once towed a hovercraft. No big deal. But we do more than towing! We provide winch outs, fuel ups, jump starts and variety of other roadside assistance services all over Colorado. My car is an (insert special snowflake situation) can your towing service handle it? Heck yeah we can. Our drivers are familiar with the majority of makes and models on the road- with our pool of experience, we know someone who has done the job before and knows how to do it again and let’s talk through what you need and get you towed and back on the road. My vehicle has an automatic transmission. Will towing damage my transmission? Not if done correctly! The background to this question is the fact that unless precautions are taken, the rotation of the wheels during towing will still turn the gears in the gear box. But because the engine and other vehicle components are not engaged, there is no lubrication provided and damage can occur. Because of this, front wheel drive vehicles can be towed with the front wheels off the ground and just the opposite for rear wheel drive. This avoids the dry grinding of gears. ​Our drivers can make use of both options but can also use a flatbed tow truck to secure your vehicle for transportation. Automatic or manual, Denver Towing has got you covered! Will towing damage my vehicle in other ways? Again, not if done correctly. The mechanisms that protect your vehicle during normal driving will provide protection during towing. Of course with flatbed towing, your ride doesn’t even touch the road. My car is lowered, lifted or otherwise modified. Can it still be towed? Absolutely. Whether it's a lowrider or a monster truck our experienced drivers can make it work. I’m stuck in the snow/mud/dirt/jello pool! I don’t want to be towed I just want to be unstuck- can you help? Yes we can! It sounds like you need a winch out. Our drivers are able to safely attach a powerful winch to your vehicle and remove you from whatever you may find yourself stuck in. And don't worry, should we find you in a jello pool we won’t ask too many questions. How do drivers know where to hook up a vehicle with so many different possible options? That is going to depend on what you need done. It can be difficult to generalize since each job is a little different. What we can tell you is that while we may not be the cheapest towing company in Denver we're the best. No damage, no BS, just good service. Buy nice or buy twice. Or in this situation buy nice or pay the repair bills later when Joe Tow Truck tries towing your Audi via the ski rack. This is going to depend on your location. We will always send our nearest tow truck but the best way to answer this question is to give us a call at 720-800-6161. Once we collect some basic information we will give you an estimated time of arrival. If the estimated time changes, you will know about it. Why should I call you guys? Straightforward , people focused towing service. Now describe your perfect towing service- how close did we get? Click here to give us a call or dial 720-800-6161 and let's get your problem solved.